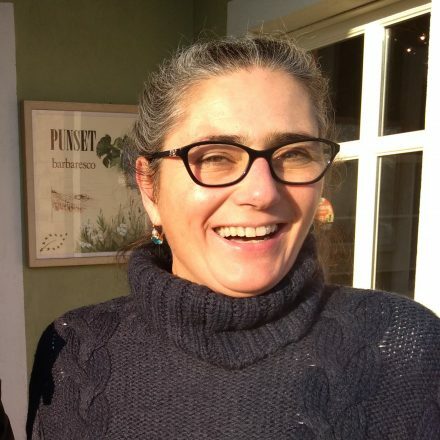 Single-handedly Marina Marcarino runs her family’s old 17ha estate that lies on a small hill – a ‘Punset’ (in piemontese) – overlooking the ancient Barbaresco village of Neive. In 1964 her father turned the ‘hobby’ farm into a commercial enterprise, & in the late 1970s, Marina rebelled against her family & instead of becoming an engineer, moved to the property & turned into a ‘contadina’ (peasant farmer), following in her grandmother’s footsteps. Marina then eschewed Alba wine school & went solo, electing to be organic from the off. Her parents gave her one vintage to show she had the mettle & could balance the books. Fortunately that vintage was 1982, & she made a 10Lira profit! She was certified (organic!) in 1987, one of the first in the region, dabbles in the occult (biodynamics since 1990) & follows a (environmental) saint called Masanobu Fukuoka (since 2018), whose philosophy is based on the idea of agriculture without interference. This does not however mean it involves less work..! Marina adopted these philosophies based on a deep respect for nature, and the belief that her vines would perform best in a completely natural environment. She felt inspired by the land and wanted to set an example to the next generations, that wines of exceptional quality can be made from working the land in this way. The decision was also, in a sense, a lifestyle choice. Dedicating much of her life to her vineyards, she draws energy and vitality from them, and the balance that they give her is also reflected in the wines. 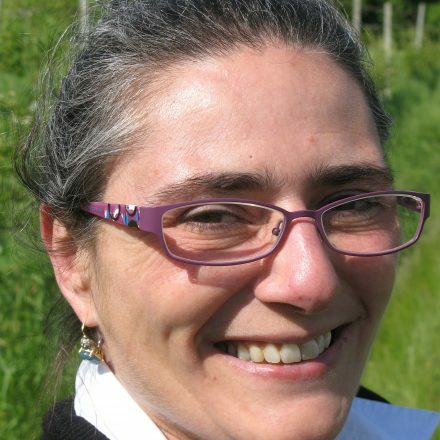 Somehow she also finds time to be President of the Albeisa association, whilst also being on the board of the Barbaresco & Barolo Consorzio, throwing a bit of conventionality into the mix! Andrew Jefford recently described her wines as “elemental”, & any comparison between her wines & those of Roagna is not welcome! Her wines are soulful, with great purity of fruit and expression, the calcium and quartz rich terroir giving the wines a certain finesse in texture. The Barbaresco Basarin and San Cristoforo ‘Campo Quadro’ are the gems of the range, and have immense ageing potential. Indeed, she believes they benefit from several years in bottle before release, thus why the current Barbaresco Basarin vintage is 2013. She invests in a new 25HL botte every five years. 2017 Langhe Arneis, Neive – tasted 18 June ’18, beautifully delicate, scented, with lemon pith, musk & a fine chalky talc texture that could only be from Neive (& Punset). Fabulous, so pretty & salty! 2016 ‘Neh? !’ Langhe Rosso, Neive – tasted Nov’18, ‘Neh’ is the equivalent of ‘Quoi’ in French, re-affirming the phrase! A blend of 50% Dolcetto, 35% Barbera, & 15% Nebbiolo: the head, the heart & the tail/length! So, blackcurrant graphite notes on the nose; a juicy mid-palate; & finezza, tension & nerve to finish! Fine Neive texture, light feet, relaxed & delicious..Neh?! 2016 Dolcetto d’Alba, Neive – tasted Nov’18, bright, peppery graphite, notable blackcurrant skins, relaxed & refined, cool coil, lovely zip as if on steroids! Exciting & delicious…restated in January ’19: fine, fresh, violets, black peppercorns, sapid, pinpoint; the product of Neive’s fine tilth. 2017 Barbera d’Alba, Neive – 14.2%, tasted Nov’18, Marina’s Barbera is definitely one of the estate’s key wines: bottled July’18, unfortunately yields in 2017 were down by 70% due to Easter hail. Hence richer, more veluto/velvety, mulberry rum/raisin nose, suave, but pert & pretty, with notable blackberry coulis flavours & intensity, along with the tell-tale Neive, silky texture. Bottled at 35mg of total sulphur….retasted in January ’19: a beautiful, joyful nose, so pretty, ripest of Spanish plum (skin), white stone fresh & alive! 2016 Barbera d’Alba, Neive – tasted 18 June ’18, 14.5%, lovely poise, succulent spanish plum flesh & generosity, alive, pure, light on its feet but still juicy, elegant. Notable for its super fine, talc texture, almost violet fragrance & refinement that speaks more of Neive’s tilth than of Barbera per se. 2016 Langhe Nebbiolo, Neive – tasted 18 June ’18, bottled in March’18, spectacular vintage in the Langhe (& in Italy, punto! ), reflected here in the pale, bright garnet, exciting rose, tea & cassis aromatics. Deliciously pure, cleansing, with charming, fresh, zippy red fruit & cool minerally notes. Dreamy….retasted Nov’18, going through a post bottling, grumpy phase! A blend of fruit from both Basarin & San Cristoforo, gleaming red eye, but coiled, structure & in need of space & time! 2013 Barbaresco Riserva Basarin, Neive – exciting first taste Nov’18, from bottle, the product of 40yo vines planted in front of the cantina: beautiful, pale, tenuous, red; the nose pretty & precise, with engaging spicy mentholated, spearmint, Chinato, esile/slender, little redcurrant fruit on the nose; the palate is cool, restrained ethereal, with detailed, racy, refreshingly candid dried rose, driven, alive, spremuta & sfumatura – ‘dentelle’ as the French would say! Stunning….retasted January’19, having been bottled in Dec’16, after 32 mths of botte grande: briught, tight, sapid, with a lovely weave of dried rose & tiny red berries. 2007 Barbaresco Riserva Basarin, Neive – tasted 18 June ’18, at first, the nose has predominantly savoury notes of cinnamon and nutmeg spice, a hint of crushed rose, but after some moments it opens up to reveal gorgeous aromas of raspberry essence, cherries sotto spirito, and herbal yet sweet liquorice spice. Complex and still evolving, this wine has great elegance and intrigue. The warmth of the vintage perhaps adding an extra layer of body and concentration. 2000 Barbaresco San Cristoforo ‘Campo Quadro’, Neive – tasted 18 June ’18, beautifully complex, with layers of gentle spice, rose water, tamarind, and tea leaf. In the background that herbal hint of liquorice again, amongst flavours of dried fig and tar. Again a warm vintage, but with remarkable freshness, the acidity of the elegant Nebbiolo grape injecting its usual lift and energy. The tannins are silky, and on the palate there is an expansive quality to the wine, its crushed velvet core urging you to have another glass…! Compelling, and utterly delicious.